Homogeneous broadening, as opposed to inhomogeneous broadening, refers to effects which increase the optical linewidth of an electronic transition by equally affecting different radiating or absorbing atoms, ions or molecules. The spectral shape of the transition cross sections of all involved atoms are then equal. Isolated non-moving atoms or ions exhibit transitions with a natural linewidth, resulting from the finite lifetimes of the energy levels involved. 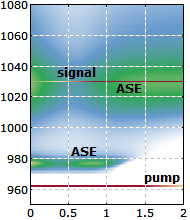 In a gas (e.g. of a gas laser), all atoms or molecules of some species experience the same average rate of collisions, which lead to collisional broadening. 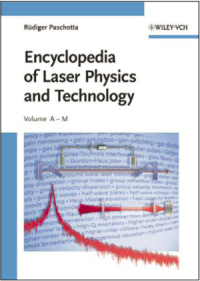 In many laser crystals, laser-active ions can occupy only one type of site in the crystal lattice. (This applies e.g. to Nd3+ ions in Nd:YAG.) The interaction of such ions with the crystal lattice via phonons then affects all these ions equally. Rapid transitions between the sublevels of the involved Stark level manifolds lead to strongly reduced sublevel lifetimes, and thus to linewidth values which are orders of magnitude larger than the natural linewidth as expected from the lifetimes of the whole Stark level manifolds. 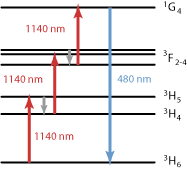 Homogeneous broadening is strongly related to homogeneous saturation in laser gain media.